The Rocks are great indeed. Today the area is an official Maryland park called, appropriately, Rocks State Park. It was previously named Deer Creek State Park. The park is home to the second highest waterfall in Maryland, the Deer Creek is a prime place to fish and go tubing, and many take advantage of the hiking trails. The biggest attraction, however, is the precarious 190 feet rock outcropping called the King and Queen Seat. 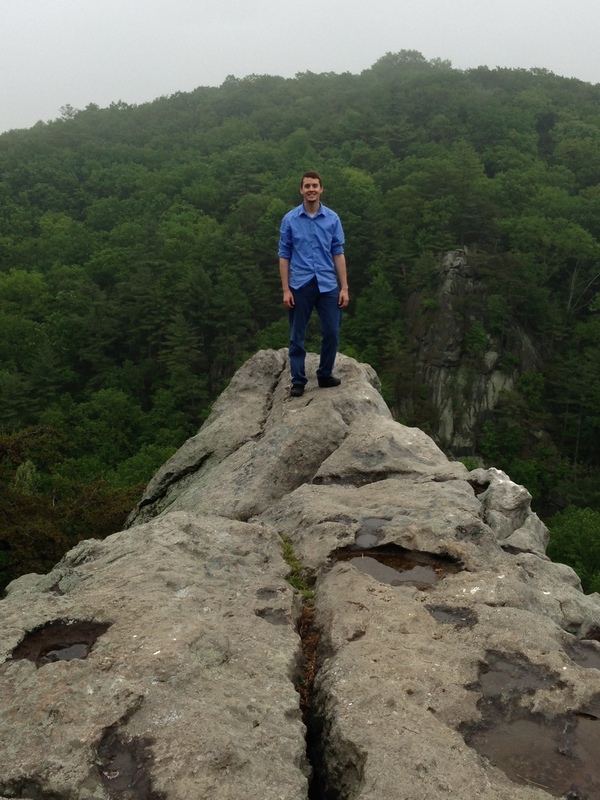 Here is a picture of me standing at the edge of the outcropping of the King and Queen seat. The spot is quite beautiful but not for those who are afraid of heights. 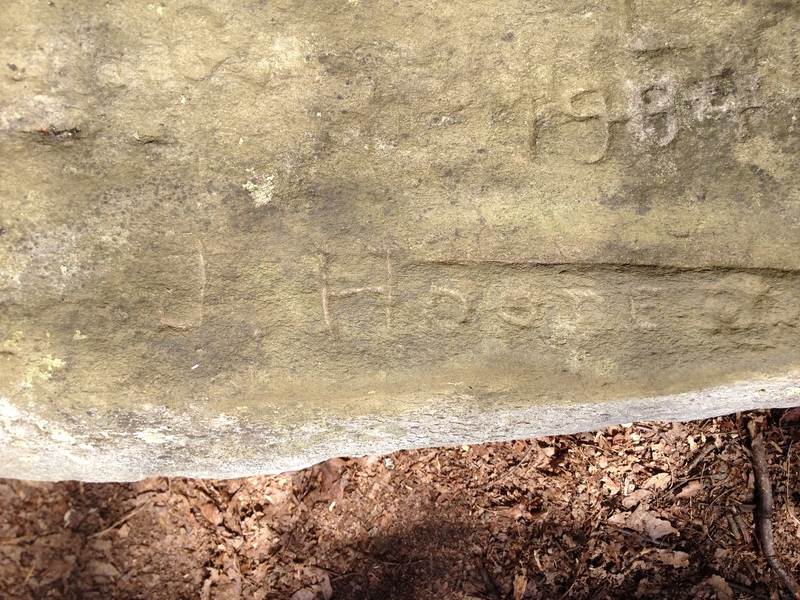 It was these carvings that brought me back to the Rocks of Deer Creek after having visited the park the last year. Between that first visit and today, I had learned that one of the names supposedly carved on the Rocks was that of John Wilkes Booth. As helpful as this piece was (especially the picture of the carving), it did not give a detailed location of the carving at the site. In the days before GPS however, how exact could you really get? I played with the idea of revisiting the Rocks last summer to search for this carving but felt that, without a bit more to go on, the likelihood of discovering the carving was quite remote. I put it on the back burner pending some more investigation. Then, in August, I had the pleasure of sitting down with Michael Kauffman, author of American Brutus. I brought up the carving to him and my desire to look for it. Though it had been many years since he had visited the Rocks, he gave me his best recollections of it and even drew me a rough map on the back of a restaurant placemat. He wished me luck in my search but also expressed one caveat which will follow later. For eight months I waited for a good opportunity to make the 2 and 1/2 hour drive up to Harford County. When I saw that author and fellow Boothie Jim Garrett was going to speak today at Tudor Hall, I decided that the trip would be justified even if I failed. My best guess is that this name is “J. HOOTE” not “J. BOOTH”. Though a tad disappointed, I did not leave the Rocks feeling dejected. This whole endeavor is a perfect example of how the process of researching can be even more rewarding than the product. The product of the research was determining for myself that the carving identified by Kimmel was NOT done by John Wilkes Booth – barely a speck of minutiae in the grand scheme of history. The process, however, was incredibly rewarding. 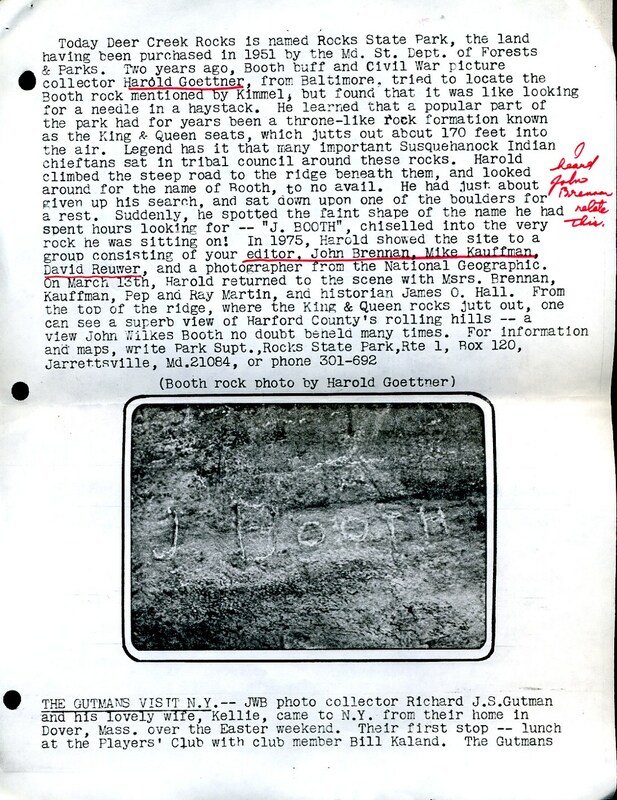 I visited the Rocks a year ago, told my colleagues at the Lincoln Discussion Symposium about it, heard about the story of Booth’s name, investigated the prior research, interviewed a person who had seen it, and successfully found the rock, among thousands, containing the same carving. Just because the product was not what I was hoping for does not negate the enjoyment I felt in investigating it. If you’re ever in the area, I recommend you all visit Rocks State Park. Not only can you enjoy the beautiful vista of the King and Queen Seat but you can also hike around with the knowledge that you are walking on the same land that the Booth children once enjoyed. And, if you’re curious, there’s a boulder practically on the left of the path before you get to the seat. Clean it off, spray it with some water, and investigate Stanley Kimmel’s “J. Booth” for yourself. 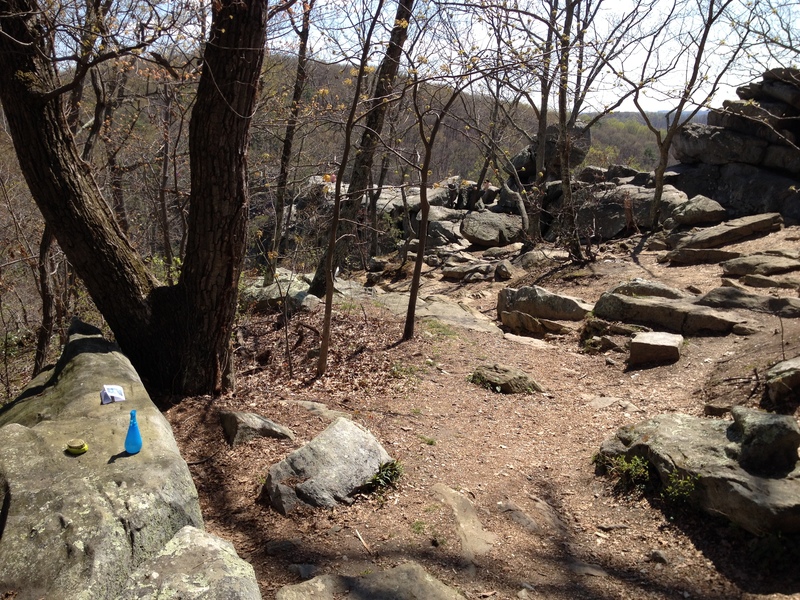 With the edge of the King and Queen Seat in the distance, my spray bottle of water, brush and piece of paper in the foreground mark the boulder containing Stanley Kimmel’s alleged “J.Booth”. Grat work, Dave! It begs the question, “who did the touch-up on the Goetner photo before I put it in my Lincoln Log? Harold, or me? I have no recollection. Very interesting Dave. I now want to visit the spot of this Booth family history. Richard, thanks for all your previous history! You’d definitely enjoy all the carvings on the King and Queen Seat, Rich. It’s like a giant tombstone. And, yes, we are all fortunate to have the scholarship of Richard Sloan and the rest of the original Boothies. Interesting Dave. I have never been there but it is on my bucket list. It truly is a breathtaking view from the edge of the King and Queen Seat, Tom. Nice work and very interesting. 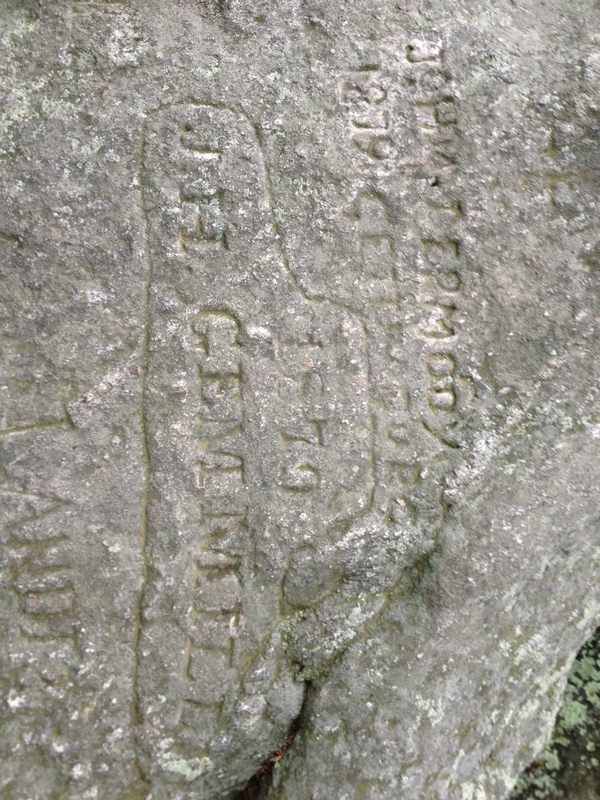 At the risk of sounding like a spoil sport, it seems to me that even if the carving had been a clear “J. Booth”, there would have been no way of knowing it was made by John. It could have been made by Junius or Joseph. No? In any case, as with the Robber Barons, it was the chase that thrilled, not the prize. You’re quite right, John. 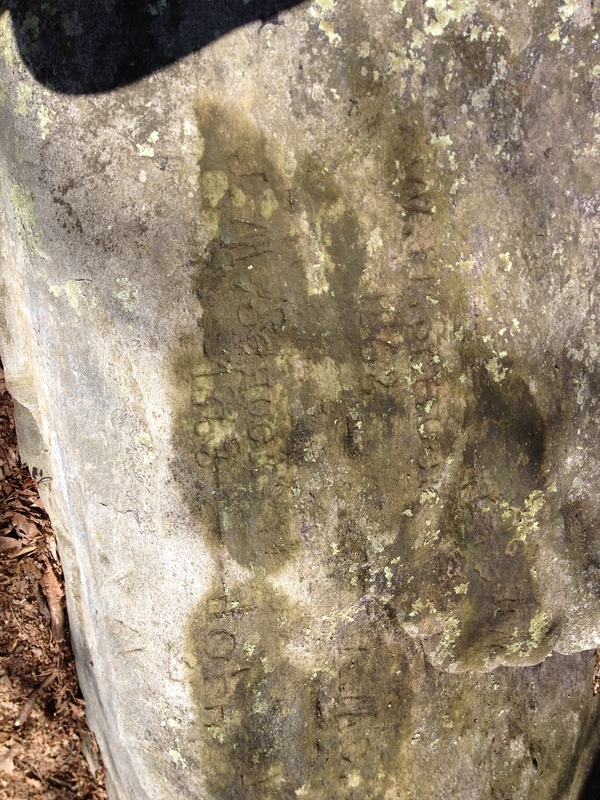 In Richard’s article (pictured above) he also brings up the point that it could have been Joseph rather than John who carved his name. Sadly, it appears to be neither. Nice job, Dave. Sometimes, its all about the journey and not the destination. Keep up the good work. Thanks, Dop. Your wonderful blog personifies the wise words you speak. Thanks so much for this information on “The Rocks.” I’ve wanted to visit this area for a long time and finally did it today. For me, the best part of the visit was looking at all the carved names and dates on the stones. There were a lot of people there, being Saturday, so it is obviously a popular stop. I couldn’t locate the “Booth” rock but had fun just being in the area. Great site. Thanks! I’m glad you enjoyed yourself, Nan. It is a beautiful spot to sit and contemplate. 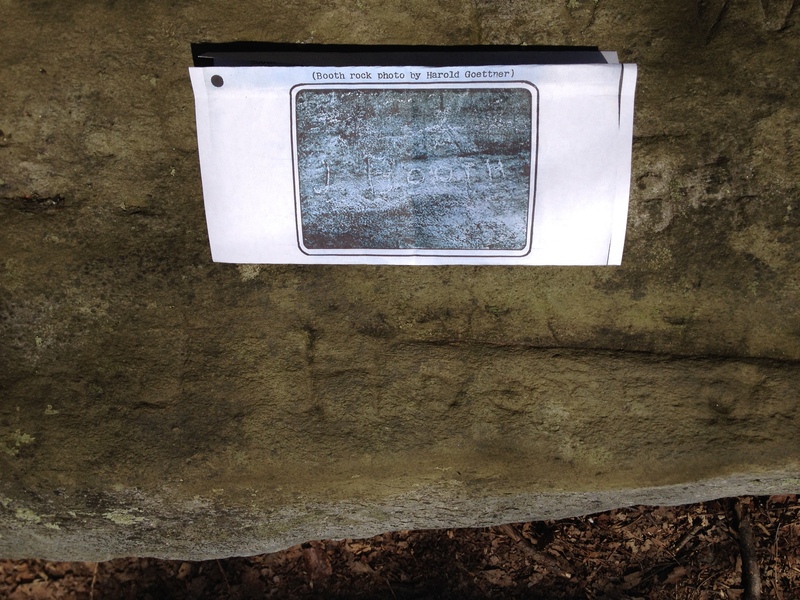 Have you tried doing a rubbing of the rock? The rangers claim you can see the name by doing so. Take a piece of paper and chalk or crayon, place the paper on the rock, and lightly rub with the crayon. Note that I have not personally confirmed this. The DNR website does confirm that this area was the first land purchased to be a state park for Maryland. That is a great idea. I’ll have to try that next time I’m there.